Sprites are 2D Graphic objects. If you are used to working in 3D, Sprites are essentially just standard textures but there are special techniques for combining and managing sprite textures for efficiency and convenience during development. 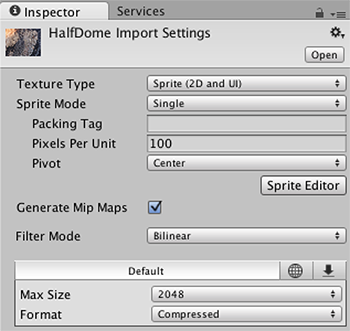 See Importing and Setting up Sprites below for information on setting up assets as Sprites in your Unity project. Use the Sprite Creator to create placeholder sprites in your project, so you can carry on with development without having to source or wait for graphics. The Sprite Editor lets you extract sprite graphics from a larger image and edit a number of component images within a single texture in your image editor. 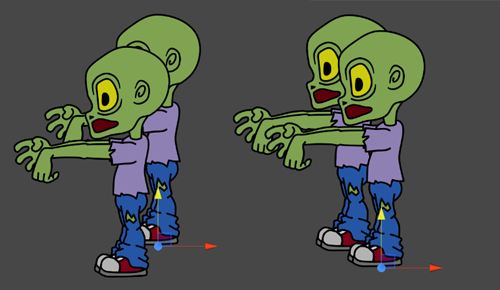 You could use this, for example, to keep the arms, legs and body of a character as separate elements within one image. Use Sprite Packer to opimize the use and performance of video memory by your project. In your computer’s Finder (Mac OS X) or File Explorer (Windows), place your image directly into your Unity Project’s Assets folder. Unity detects this and displays it in your project’s Project view. In Unity, go to Assets > Import New Asset to bring up your computer’s Finder (Mac OS X) or File Explorer (Windows). From there, select the image you want, and Unity puts it in the Project view. See Importing for more details on this and important information about organising your Assets folder. If your project mode is set to 2D, the image you import is automatically set as a Sprite. For details on setting your project mode to 2D, see 2D or 3D Projects. Click on the asset to see its Import Inspector. For details on Sprite Texture Type settings, see Texture type: Sprite (2D and UI). See in Glossary > Graphics) provide a setting called Transparency Sort Mode, which allows you to control how Sprites are sorted depending on where they are in relation to the Camera. More specifically, it uses the Sprite’s position on an axis to determine which ones are transparent against others, and which are not. An example of when you might use this setting is to sort Sprites along the Y axis. This is quite common in 2D games, where Sprites that are higher up are sorted behind Sprites that are lower, to make them appear further away. Perspective - Sorts based on perspective view. Perspective view sorts Sprites based on the distance from the Camera’s position to the Sprite’s center. Orthographic - Sorts based on orthographic view. Orthographic view sorts Sprites based on the distance along the view direction. See in Glossary are sorted based on the distance of this axis from the camera. Use a value between –1 and 1 to define the axis. For example: X=0, Y=1, Z=0 sets the axis direction to up. X=1, Y=1, Z=0 sets the axis to a diagonal direction between X and Y. For example, if you want Sprites to behave like the ones in the image above (those higher up the y axis standing behind the Sprites that are lower on the axis), set the Transparency Sort Mode to Custom Axis, and set the Y value for the Transparency Sort Axis to a value higher than 0. Copyright © 2018 Unity Technologies. Publication: 2018.2-002Q. Built: 2019-02-05.